Appearances go further than you may think. Whether it’s a hotel lobby or the business attire of a highly-priced solicitor, we look for order and discipline to reassure us of quality. 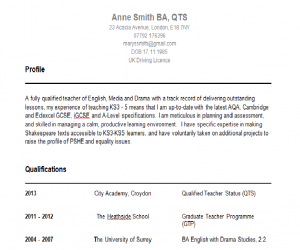 Your CV should be clean, concise and easily navigable. Following your contact details should be a paragraph explaining your main strengths within the sector and as an employee generally. There must be purpose to every word in this paragraph, so avoid listing ‘soft skills’. It’s lovely to know that you’re a “highly organised team-player”, but aren’t we all? I’d far rather know that your excellent organisation saw you “coordinate a KS4 intervention programme that saw a 60% rise in attendance from the previous year, resulting in GCSE results of 89% A*-C grades” in your subject. Your weapons here are intelligent wording, clever sentence structures and a positive tone. Don’t underestimate the power of negative language. Even words such as ‘but’, ‘however’ and ‘although’ can put a whole new spin on things and should be avoided. Insert a table and hide the lines to present this neatly. You should start with the most recent qualification, presenting the date in column one, name of institution in column two and subjects and grades in the third. Qualifications should go back as far as GCSE, and you should include grades for everything. This section of your CV can remain fairly clinical, clear and informative. Along with the profile, this is an opportunity to show commitment to your chosen sector. You should be prepared to explain any changes to or gaps in your career. Begin with your most recent employer. Dates are essential! If they are incorrect and your job history doesn’t match up with references, your honesty may be questioned. If you’ve had gaps in employment, it’s you decision whether to wait for employers to ask questions or be really upfront by adding a note at the bottom of your CV. Bullet-point your most impressive achievements in each job and make sure this represents as big a range of responsibilities as possible. You can note that “references are available upon request”, but that may beg the question, “why haven’t you provided them, then?” Including the name and contact email/telephone number of your referees saves time, and shows that you have an employment history to be proud of, with nothing to hide. It demonstrates transparency, efficient administration on your part, and will save time in selecting you for the position you’re after. To save space, include your referees as a footer. It will give your CV a nice, professional finish too. Did you know that Prospero Teaching runs CV writing and interview skills workshops? Read here to find out more. 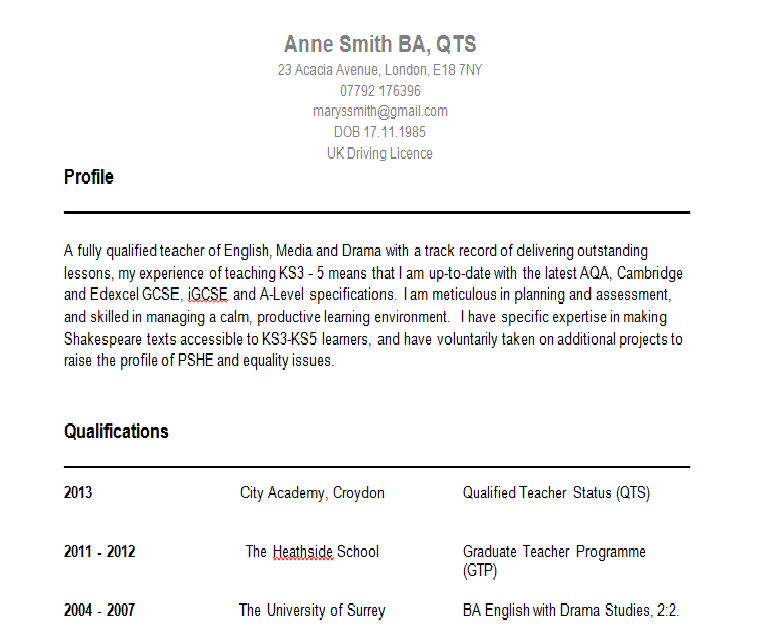 Do you have any tips you’d like to share with the Prospero Teaching Community that other teachers might find useful for their own CVs? Are there other courses you’d like Prospero Teaching to put on that would help you find your dream teaching job?